We’re trying to figure out whether race and gender is indeed a factor in the advantages provided in America and is it hindering or helping the individuals it aims to support. The short answer is HELL YES! You know and I know that the racial issues in America are not waning, but are heightening by the minute, especially as we head into the presidential elections. The University of Texas is preparing to lead the pack on the issue of affirmative action. 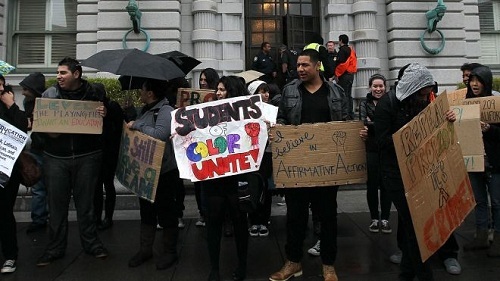 The Supreme Court will be examining the school’s admission policies and if its necessary that they include affirmative action, according to the Huffington Post. The university caught a little trouble with one of its students back in 2008, because she wasn’t admitted automatically. Everybody says there is a problem called White Privilege. Everybody says this White Privilege problem will be solved when the third world pours into EVERY white country and ONLY into white countries. The Netherlands and Belgium are just as crowded as Japan or Taiwan, but nobody says Japan or Taiwan will solve Asian Privilege by bringing in millions of third worlders and quote assimilating unquote with them. Everybody says the final solution to this White Privilege problem is for EVERY white country and ONLY white countries to “assimilate,” i.e., intermarry, with all those non-whites. What if I said there was this problem called Black Privilege and this Black Privilege would be solved only if hundreds of millions of non-blacks were brought into EVERY black country and ONLY into black countries? How long would it take anyone to realize I’m not talking about a Black Privilege problem. I am talking about the final solution to the BLACK problem?